A series of extraordinary vintage New Orleans-inspired evenings are on the cards, as lovers of jazz and authentic cuisine are invited to A Night Down in New Orleans at Egyptian Ella’s – a fun and novel event laced with live upbeat jazz, the hippest emcee in town and a wonderful dining experience which has three versions in and around Durban from month-end July to month-end August. The first showing of this quirky tale opens up at The Prep Room at Glenwood Prep School for two evenings only on July 28 and 29. It then moves to the Rhumbelow Theatre at Tina’s Hotel in Kloof on August 5 and 6, with the final show in Durban planned for the Islander Room at the Point Yacht Club on August 26 and 27. Performed by the fabulous Jazz Minkeys, A Night Down in New Orleans at Egyptian Ella’s is a tale of “Ella”, an almost-exotic dancing-girl living the high life in the speakeasies and sporting houses of New Orleans, but when life gets too good she begins to put on weight losing her regular appeal. The show follows her musically in a journey of self-discovery which takes her across the ocean to the banks of the River Nile and then on to the place where she rightly belongs. Expect a great story, told by one of Durban most well-loved emcees and spoken word heroes, Iain Ewok Robinson. Joining the festivities at the Prep Room, Ryan Renaude, celebrated DJ, will be spinning some 1920 tunes with a big gramophone horn. Durban Songbird Chloe Clark will step in for Robinson for the Point Yacht Club event. 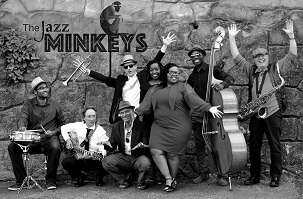 The narrative will be woven with great sounds by an eight-piece top-notch jazz orchestra comprising some of Durban finest musicians: The Jazz Minkeys. The Jazz Minkeys is Durban’s fun-filled post-modern jazz orchestra, recreating the vibrant exuberance and stylistic nuances of the early popular jazz ensembles like Kenny Ball, Louis Armstrong and Louis Prima. The group play a wide variety of commercially-appealing jazz and popular music ranging from early jazz classics to more modern day hits and some original tunes. Daniel Sheldon features on trumpet and flugel horn. Sheldon is the band leader and has been a familiar face on the Durban jazz scene for 15 years. Sharing the role of band leader, Tom Hare joins him on sax, flute and trumpet. Hare has a colourful CV with experience from around the world as both a jazz player and a composer and arranger. Internationally-acclaimed pianist and music lecturer, Neil Gonsalves, joins the team on piano. Durban’s own Demi Fernandez plays jazz and flamenco guitar. Jazz vocalist and guitarist, Zoe Masuku, together with Nosihle Zulu, a celebrated singer and Idols 2016 Top 8 Finalist, share the vocals with the much-loved and ever versatile Brandon Hore on double bass. Each venue will create their own special themed menu of New Orleans inspired cuisine – each adding their own interpretation and nuances. August 26–27: Islander Room, Point Yacht Club. Doors open at 18h30. Bookings on 031 301 4787. More info and bookings are through the individual venues or like the Jazz Minkey’s Facebook page.